[EN] Fifth release of a series of mixtapes raising awareness to the Anonymous and Occupy Wall Street movements. This fifth release also focuses on CISPA. Organized in colaboration with xDA hackerspace, this release is part of Enough Records social and political activist sub-label Anonymous Archives and has it's own minipage. Mixed by Substak & ps. Cover by Roland Henry. 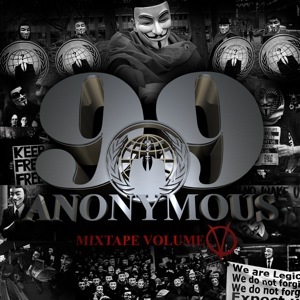 [PT] Quinto volume de uma série de mixtapes com o objectivo de chamar a atenção aos movimentos sociais Anonymous e Occupy Wall Street. Esta quarta edição também se foca na CISPA. Organizado em colaboração com o hackerspace xDA, esta edição faz parte da sub-label Anonymous Archives orientada a activismo social e politico. Para mais informações sobre esta edição por favor visitem a página. Misturado por Substak & ps. Grafismo por Roland Henry.